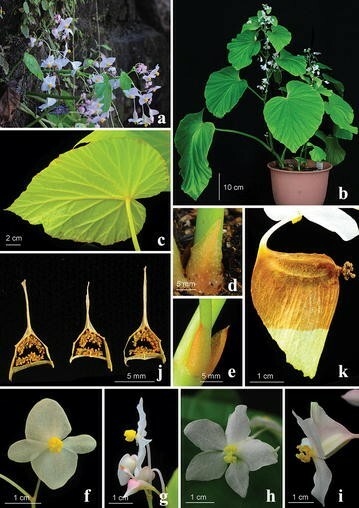 A new species, Begonia myanmarica, was discovered from Myanmar and herein documented. Characterized by a single developed wing in the ovary/fruit, this species would be assigned to sect. Monopteron (sensu Doorenbos et al. in The sections of Begonia including descriptions, keys and species lists: studies in Begoniaceae VI. Wageningen Agricultural University, Wageningen, 1998) that is known by B. griffithiana and B. nepalensis from the Himalaya. To confirm its sectional assignment, we conducted morphological, phylogenetic and cytological studies. Morphological observations indicated that B. myanmarica was distinguishable from the two known species of sect. Monopteron by the leaf shape and size, 1-locular ovary, parietal placentation and chromosome number. Molecular phylogenetic analysis using nrITS sequences showed that B. myanmarica was not allied with the clade of sect. Monopteron, though both were nested within sect. Platycentrum-sect. Sphenanthera clade. Studies of morphology, molecular phylogenetics and cytology support the recognition of the new species, Begonia myanmarica, which is fully described and illustrated. Our results also indicate that B. myanmarica is not closely related to species previously assigned to sect. Monopteron, suggesting that the fruit morphology of a single developed wing in the ovary/fruit characterizing sect. Monopteron is homoplasious. Begonia L. (Begoniaceae), comprising more than 1800 species classified into 68 sections (Doorenbos et al. 1998; Hughes et al. 2015; Christenhusz and Byng 2016), is one of the largest genera of vascular plants. With more than 760 Begonia species in Asia, Doorenbos et al. (1998) recognized 18 sections [Alicida C.B. Clarke, Apterobegonia Warb., Baryandra A. DC., Bracteibegonia A. DC., Coleocentrum Irmscher, Diploclinium (Lindl.) A. DC., Haagea (Klotzsch) A. DC., Heeringia Irmscher, Lauchea (Klotzsch) A. DC., Monophyllon A. DC., Monopteron (A. DC.) Warb., Parvibegonia A. DC., Petermannia (Klotzsch) A. DC., Platycentrum (Klotzsch) A. DC., Putzeysia (Klotzsch) A. DC., Reichenheimia (Klotzsch) A. DC., Ridleyella Irmscher, and Sphenanthera (Hassk.) Warb.]. Thereafter, four additional Asian sections were proposed [Leprosae (T.C. Ku) Y.M. Shui, Monolobium T.C. Ku, Pleiothece T.C. Ku, and Symbegonia (Warb.) G. Forrest & Hollingsw.] (Ku 1999; Shui et al. 2002; Forrest and Hollingsworth 2003; Ku et al. 2007). These 22 Asian sections are highly unequal in species numbers: eight of the large sections (Petermannia, Platycentrum, Diploclinium, Reichenheimia, Coleocentrum, Parvibegonia, Sphenanthera, and Symbegonia) comprise 95% of Asian Begonia species and the rest 14 sections each with less than five species (Thomas 2010). Several molecular phylogenetic studies have demonstrated the paraphyly or polyphyly of these large sections, suggesting homoplasy of morphological characters used for current sectional delimitations (Tebbitt et al. 2006; Thomas et al. 2011; Chung et al. 2014). However, few studies have tested the monophyly of small Asian section of Begonia thus far [but see Rajbhandary (2010); Rubite (2010); Thomas (2010)]. Myanmar is botanically a most interesting country, but there have been no critical floristic surveys for nearly half a century. Thus far about 60 species of Begonia have been recorded from Myanmar (Hughes 2008; Tanaka and Hughes 2007; Tanaka and Hayami 2011; Peng et al. 2014b; Tanaka and Peng 2016). During the fieldwork in western Myanmar on 2 February 2012, the second author (YDK) collected an unknown Begonia with only one developed wing in ovary/fruit, which is the key character of Begonia sect. Monopteron sensu Doorenbos et al. (1998) first delimited by de Candolle (1864) as Mezierea sect. Monopteron. Presently, only two species, B. griffithiana Warb. and B. nepalensis Warb., are recognized in sect. Monopteron (de Candolle 1864; Doorenbos et al. 1998). Begonia nepalensis, the type species of sect. Monopteron, is native to Bhutan, Nepal and India (Fig. 5; Doorenbos et al. 1998; Hughes et al. 2015). Its chromosome number was reported to be 2n = 16 (Legro and Doorenbos 1971), with an uncertain chromosome count 2n = 28–42 by Sharma and Bhattacharyya (1961). Begonia griffithiana, occurring in Bhutan and India (Fig. 5), is characterized by lanceolate to oblong leaves with subcordate base. Chromosome number of B. griffithiana was documented as 2n = 22 (Doorenbos et al. 1998). Based on recent systematics and phylogenetics of Begonia, sect. Monopteron is nested within the Platycentrum-Sphenanthera clade (Rubite 2010; Thomas 2010; Rajbhandary et al. 2011; Leong 2017). Although morphology of the 1-winged ovary/capsule of the undescribed Begonia should be assigned to sect. Monopteron, it differs from B. griffithiana and B. nepalensis significantly the leaf shape, leaf size and distribution. In this study, we described it as a new species. We also provide detailed morphological data and molecular phylogenetic analysis to elucidate the sectional assignment for this species. Rhizomes of Begonia myanmarica collected by YDK from Myanmar were cultivated in the experimental greenhouse of the Biodiversity Research Center, Academia Sinica, Taipei, Taiwan. Fully grown plants with flowers and fruits (Peng 23565, 23566) were used for morphological observation. The two species of sect. Monopteron, B. griffithiana (Peng 20851) and B. nepalensis (Peng 20854), cultivated in the greenhouse were also studied as a comparison. Root tips were obtained from cultivated materials from greenhouse of Academic Sinica. Somatic chromosome of the new species, B. myanmarica (Peng 23566), and two species of sect. 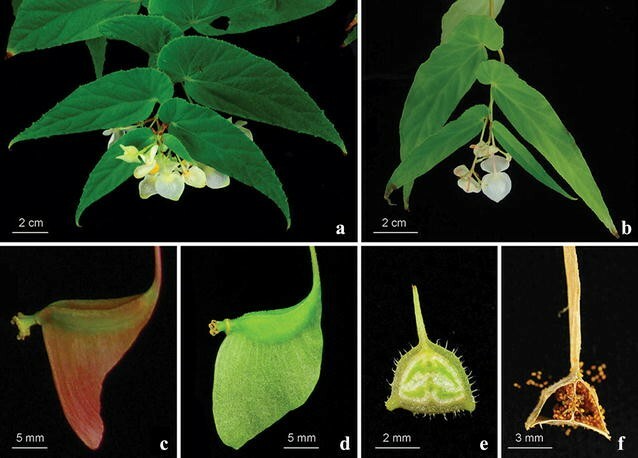 Monopteron: B. griffithiana (Peng 20851) and B. nepalensis (Peng 20854), were examined using root tips following the methods by Peng et al. (2014a). DNA sequences of the nuclear ribosomal internal transcribed spacer (nrITS) were used to evaluate the phylogenetic relationship among new species and the two species of sect. Monopteron. DNA extraction, PCR amplification and DNA sequencing followed Chung et al. (2014). To test the monophyly of sect. Monopteron and sectional assignment of new species, nrITS of 96 species used in Chung et al. (2014) were adopted for phylogenetic analysis (see Appendix for details). Alignment was conducted using MUSCLE implemented in MEGA5.2 (Tamura et al. 2011) and verified in Mesquite v3.03 (Maddison and Maddison 2015). Phylogenetic relationships were constructed by Bayesian Inference (BI) method. The best nucleotide substitution models were determined by Modeltest v2.7 (Posada and Crandall 1998). For BI analysis, the consensus topology was based on Markov chains algorithm implemented in MRBAYES 3.0b4 (Huelsenbeck and Ronquist 2001). Four chains of Markov chain Monte Carlo (MCMC) simulation were carried out for 1,500,000 generations each with trees sampled per 500 generations. The first 500 trees of sampled trees were discarded before the node probability was calculated (posterior probability: PP). MYANMAR. Sagaing Region, Alangdaw Kathapa National Park, 22°18′ 47.7″ N, 94°28′32.7″ E, alt. 438 m, mixed deciduous forest, along the stream. Living collection made by Seong-hyun Cho, Young-dong Kim, Yong-in Kim & Jeong-hun Lee MM-0611, 2 Feb 2012; type specimens (with flowers and fruits) pressed from plants cultivated in the experimental greenhouse, Academia Sinica, Taipei, Taiwan, 20 Mar 2016, Ching-I Peng 23566 (holotype: RAF; isotypes: HAST, KB). Begonia myanmarica is a unique species with an erect habit; large, ovate to broadly ovate leaves (ca. 20–40 cm long, 22–30 mm across); sole, much protruded wing in ovary/fruit; 1-locular ovary with parietal placentation and 2 placentae; and the somatic chromosomes are determined as 2n = 38. Herbs monoecious, perennial. Rhizomes stout, 2–4 cm across, to 9 cm long; erect stem 50–90 cm tall, 1–2 cm thick, internodes 5–15 cm, glabrous. Stipules caducous, glabrous, triangular, apex aristate or apiculate, margin entire, 7–15 mm long, 6–15 mm wide. Leaves alternate, green with slightly paler veins; petiole 20–40 cm long, 2.2–3 cm across, glabrous; leaf blade fleshy, asymmetric, ovate to broadly ovate, 21–35 cm long, 15–28 cm wide, upper surface glabrous, underside slightly hairy on veins, base obliquely cordate, margin irregularly loosely serrulate or denticulate, apex acute or short acuminate; venation 7-or 8-palmate. Inflorescence mainly terminal but also axillary racemes of dichasial cymes, bisexual, protandrous; cyme 10–15 cm long, with 2 female flowers at apex and 7–9 male flowers at base, peduncle 2–5 cm long, glabrous; bracts deciduous, ovate to triangular, apex acuminate, margin entire, 0.7–1.5 cm long, 0.4–0.6 cm wide. Male flower: pedicel 2–2.8 cm long, glabrous; tepals 4, white to pinkish, outer 2 ovate or orbicular, 1.9–2.3 cm long, 1.5–2 cm wide, inner 2, broadly oblong, 1.8–2.3 cm long, 0.5–1.5 cm wide, glabrous; androecium actinomorphic, subglobose, ca. 0.7 cm across, stamens 60–80, yellow, clavate; filaments ca. 2 mm long, fused to a short central column; anthers 1–1.2 mm long, apex truncate. Female flower: pedicel 1.7–3.5 cm long, glabrous; ovary white, wings 3, manifestly unequal, 2 side wings almost undeveloped, abaxial wing much protruded, white to pale greenish or pinkish, 1-locular; placentation parietal, placentae 2, each bilamellate; tepals 5, white in the greenhouse (pinkish in the wild), unequal, elliptic to obovate, 1.5–2 cm long, 0.5–1.1 cm wide, apex obtuse; styles 2, ca. 5 mm long, 2- or 3-cleft, fused at base, stigmatic band wavy-twisted and spiralled. Capsule nodding, stalk 3.5–5.5 cm long, abaxial wing triangular to rectangular, 2.4–3.8 cm tall, 2.0–2.4 cm wide, lateral two wings barely developed, rounded, 0.2–0.4 cm tall, 1.8–2.2 cm wide. Seeds barrel-shaped, 0.25–0.3 mm long. The epithet refers to Myanmar (formerly Burma) where it was discovered. MYANMAR. Sagaing Region: Alang Daw Kathapa National Park, 22°18′47.7″ N, 94°28′32.7″ E, 438 m, 2 Feb 2012, Peng 23565 (HAST); 22°18′49.5″ N, 94°28′30.2″ E, 434 m, 2 Feb 2012, MM-0556 (KB); 22°18′47.7″ N, 94°28′32.7″ E, 438 m, 2 Feb 2012, MM-0611 (KB, HHU); 22°18′44.2″ N, 94°28′28.7″ E, 380 m, 2 Feb 2012, MM-0616 (KB); 22°19′25″ N, 94°29′37.7″ E, 380 m, 5 Feb 2012, MM-0848 (KB, RAF). Somatic chromosome at metaphase of B. myanmarica were shown to be 2n = 38 in this study (Fig. 4c). Begonia myanmarica has only one developed wing in ovary/fruit (Figs. 2k, 3c, d), the key character of sect. Monopteron in Begonia (Doorenbos et al. 1998). The new species, however, deviates from sect. Monopteron with axillary placentation and two locules in ovary (Fig. 3e, f) in having 1-locular ovary and parietal placentation (Fig. 2j). Additionally, B. myanmarica has ovate to broadly ovate leaves and large leaves (ca. 20–40 cm long, 22–30 mm across) (Fig. 2b, c), whereas leaves of B. griffithiana and B. nepalensis are lanceolate to oblong and no longer than 20 × 10 cm (Fig. 3a, b). Cytologically, somatic chromosome of B. myanmarica is determined to be 2n = 38 (Fig. 4c), while chromosomes of B. griffithiana and B. nepalensis are both 2n = 16 (Fig. 4a, b) in our study. Geographically, B. myanmarica is endemic to Myanmar while B. griffithiana and B. nepalensis are distributed in India, Nepal and Bhutan (Fig. 5). We concluded that B. myanmarica is sharply distinct from B. griffithiana and B. nepalensis. In our molecular phylogenetic study, B. griffithiana and B. nepalensis form a strongly supported clade (posterior probability, PP = 1) nested within the clade dominated by sect. Platycentrum-sect. Sphenanthera clade [Fig. 6; Clade PLA-SPH in Chung et al. (2014)], congruent with the studies of Rubite (2010), Thomas (2010), Rajbhandary et al. (2011), and Leong (2017). Two sampled individuals of B. myanmarica also fall within the Clade PLA-SPH but not clustered within sect. Monopteron clade (Fig. 6), suggesting that the fruit morphology of a single developed wing in the ovary/fruit is homoplasious. Morphologically, the key characters for sect. Platycentrum-sect. Sphenanthera clade are evergreen, rhizomatous and two locules in ovary (Leong 2017). Begonia myanmarica is evergreen with stout rhizome, but having 1-locular ovary. Compared with other species in sect. Platycentrum-sect. Sphenanthera, B. myanmarica is unique with a single developed wing and having 1-locular ovary not known in any other taxa in this clade. Further studies with increasing sampling of Myanmar Begonia are needed to place B. myanmarica in its proper infrageneric position. YDK, KMH, and SHC conducted the fieldwork and collected the new species from Myanmar; YDK and CIP took color photographs of B. myanmarica from the wild and the experimental greenhouse respectively; YHT carried out the morphological observation and undertook laboratory analyses; YK carried out the cytological study; YHT, CIP and KFC prepared the manuscript. All authors read and approved the final manuscript. This work was supported by grants from the National Institute of Biological Resources (NIBR), the Ministry of Environment (MOE) of the Republic of Korea (NIBR2016 04201) and Biodiversity Research Center, Academia Sinica, Taiwan. Our gratitude extends to the Ministry of Natural Resources and Environmental Conservation of Myanmar for the continuous guidance and support for this project. We are indebted to Dr. Rekha Morris who provided research materials of B. griffithiana and B. nepalensis for cytological study; Mr. Ku-Feng Lin, manager of Academia Sinica greenhouse, for providing facilities and assistance to maintain the Begonia living collections. Voucher information and GenBank accession numbers in newly generated sequences and morphological observation are listed here. Voucher data is given using following format: Taxon name, Collection locality, collector(s) and collector number (herbarium for voucher specimen), GenBank accession numbers for nrITS. Other nrITS sequences refer to Chung et al. (2014). Begonia myanmarica C.I Peng & Y.D. Kim, Myanmar, Peng 23565 (HAST), KY088184; Peng 23566 (HAST), KY088185. Begonia griffithiana Warb., India, Peng 20851 (HAST), KY088186. Begonia nepalensis Warb., India, Peng 20854 (HAST), KY088187. Begonia aequata A. Gray, AF485147; Begonia alicida C.B.Clarke ex Hook. f., KF636419; Begonia alveolata Yu, AY048977, Begonia amphioxus Sands, AF485150; Begonia arachnoidea C.I Peng, Yan Liu & S.M. Ku, KF636420; Begonia augustinei Hemsl., KF636421; Begonia auritistipula Y.M. Shui & W.H. Chen, KF636422; Begonia austroguangxiensis Y.M. Shui & W.H. Chen, KF636423; Begonia balansana Gagnep., AF485091; Begonia bamaensis Yan Liu & C.I Peng, KF636424; Begonia bataiensis Kiew, KF636425; Begonia berhamanii Kiew, KF636426; Begonia bipinnatifida J.J.Sm., KF636427; Begonia boisiana Gagnep., AF534719; Begonia bolsteri Merr., KF636428; Begonia brevipes Merr., KF636429; Begonia brevirimosa Irmsch., AF485145; Begonia cathayana Hemsl., AF280106; Begonia cavaleriei H.Lév., KF636430; Begonia chingii Irmsch., KF636432; Begonia cirrosa L.B.Sm. & Wassh., AY048979; Begonia contracta Warb., KF636433; Begonia cylindrica D.R.Liang & X.X.Chen, KF636434; Begonia decora Stapf, KF636435; Begonia dipetala Graham, AF469124; Begonia dregei Otto & A.Dietr., AY429336; Begonia dryadis Irmsch., KF636436; Begonia edulis H.Lév., KF636437; Begonia erythrogyna Sands, KF636438; Begonia fimbristipula Hance, KF636439; Begonia fuscisetosa Sands, KF636440; Begonia goegoensis N.E.Br., AF485138; Begonia grandis subsp. holostyla Irmsch., AF485088; Begonia griffithiana Warb., KY088186; Begonia gueritziana Gibbs, KF636441; Begonia guixiensis Yan Liu, S.M. Ku, C.I Peng, KF636442; Begonia hainanensis Chun & F.Chun, KF636443; Begonia handelii Irmsch., AY048982; Begonia hatacoa Buch.-Ham. ex D. Don, KF636444; Begonia hemsleyana Hook. f., AF485099; Begonia hernandioides Merr., KF636445; Begonia inostegia Stapf, KF636446; Begonia isoptera Dryand. ex Sm., KF636447; Begonia jingxiensis D. Fang & Y.G. Wei, KF636448; Begonia kinabaluensis Sands, KF636450; Begonia kingiana Irmsch., KF636451; Begonia labordei H.Lév., KF636452; Begonia lagunensis Elmer, KF636453; Begonia lambii Kiew, KF636454; Begonia laminariae Irmsch., KF636455; Begonia lanternaria Irmsch., KF636456; Begonia leprosa Hance, KF636457; Begonia liuyanii C.I Peng, S.M. Ku & W.C. Leong, KF636458; Begonia longa C.I Peng & W.C. Leong, KF636459; Begonia longicarpa K.Y. Guan & D.K. Tian, AY048985; Begonia longifolia Blume, AF485105; Begonia longistyla Y.M.Shui & W.H.Chen, KF636460; Begonia luzhaiensis T.C. Ku, KF636461; Begonia madaiensis Kiew, KF636462; Begonia masoniana Irmsch. ex Ziesenh., KF636463; Begonia merrittii Merr., KF636464; Begonia nigritarum Steud., KF636465; Begonia ningmingensis D. Fang, Y.G. Wei & C.I Peng, KF636466; Begonia oreodoxa Chun & F.Chun ex C.Y.Wu & T.C.Ku, KF636467; Begonia oxysperma A.DC., AF485131; Begonia palmata D.Don, KF636468; Begonia panayensis Merr., KF636469; Begonia paracauliflora sp. ined., KF636470; Begonia parvula H. Lév. & Vaniot, KF636471; Begonia pavonina Ridl., KF636472; Begonia pedatifida H.Lév., KF636473; Begonia peltatifolia H.L. Li, KF636474; Begonia pengii S.M. Ku & Yan Liu, KF636475; Begonia pseudolateralis Warb., KF636476; Begonia pulvinifera C.I Peng & Yan Liu, KF636477; Begonia ramosii Merr., KF636478; Begonia ravenii C.I Peng & Y.K.Chen, KF636479; Begonia retinervia D.Fang, D.H.Qin & C.I Peng, KF636480; Begonia ruboides C.M. Hu ex C.Y.Wu & T.C.Ku, KF636481; Begonia rufipila Merr., KF636482; Begonia semiparietalis Yan Liu, S.M.Ku & C.I Peng, KF636483; Begonia serratipetala Irmsch., KF636484; Begonia sikkimensis A.DC., KF636485; Begonia sinofloribunda Dorr, KF636486; Begonia subnummularifolia Merr., KF636487; Begonia sutherlandii Hook. f., AF485215; Begonia symsanguinea L.L. Forrest & Hollingsw., AF485151; Begonia taiwaniana Hayata, KF636488; Begonia variabilis Ridl., AY753732; Begonia variegata Y.M. Shui & W.H.Chen, KF636489; Begonia versicolor Irmsch., AF485090; Begonia wadei Merr. & Quisumb., KF636490; Begonia wenshanensis C.M. Hu ex C.Y. Wu & T.C. Ku, AY048974; Begonia yappii Ridl., KF636491. Begonia myanmarica C.I Peng & Y.D. Kim, Myanmar, Peng 23565 (HAST); Peng 23566 (HAST). Begonia griffithiana Warb., India, Peng 20851 (HAST). Begonia nepalensis Warb., India, Peng 20854 (HAST). Begonia cathayana Hemsl., China, Peng 20288 (HAST). Begonia decora Stapf, Malaysia, Peng 20261 (HAST). Begonia dryadis Irmsch., China, Peng 18016 (HAST). Begonia edulis H.Lév., China, Peng 18747 (HAST). Begonia hatacoa Buch.-Ham. ex D. Don, Peng 20861 (HAST). Begonia hemsleyana Hook. f., China, Peng 17590 (HAST). Begonia laminariae Irmsch., China, Peng 17447 (HAST). Begonia oreodoxa Chun & F. Chun ex C.Y. Wu & T.C. Ku, China, Peng 20454 (HAST). Begonia palmata D. Don, Taiwan, Peng 20993 (HAST). Begonia pavonina Ridl., Malaysia, Peng 20239 (HAST). Begonia pedatifida H. Lév., China, Peng 18779 (HAST). Begonia sikkimensis A. DC., China, Peng 20848 (HAST). Begonia augustinei Hemsl., China, Peng 20759 (HAST). Begonia versicolor Irmsch., China, Peng 18688 (HAST). Begonia balansana Gagnep., Vietnam, Peng 21928 (HAST). Begonia handelii Irmsch., China, Peng 17513 (HAST). Begonia longifolia Blume, Taiwan, Peng 16795 (HAST).